I chanced upon this little gem a few months ago on Gearslutz. I knew John Flynn’s work in the past as a mastering engineer but also as the developer of the Teufel Reverb plugin. Since then it’s been used on all my work. 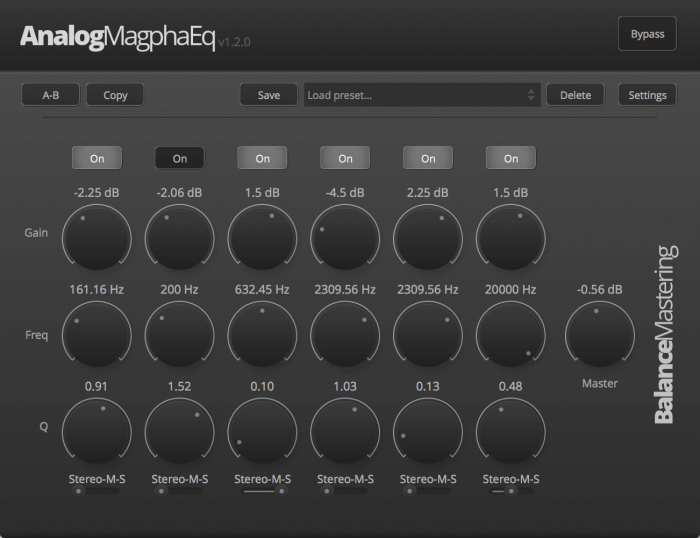 It’s an amazing mastering EQ plug-in that sounds extremely musical and smooth and is extremely flexible. Some of the presets are a lesson in how powerful this EQ can be. It’s also very affordable. I’d never heard about this plug-in until a friend recommended it to me. 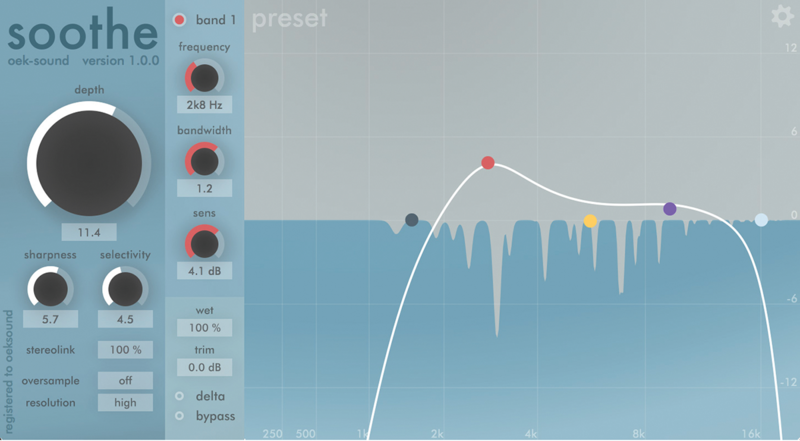 Oeksound Soothe is an incredible tool that removes any harshness dynamically and very transparently. Whether I’m recording vocals, mixing or mastering, this plug-in is in my chain. Nothing comes close to it. 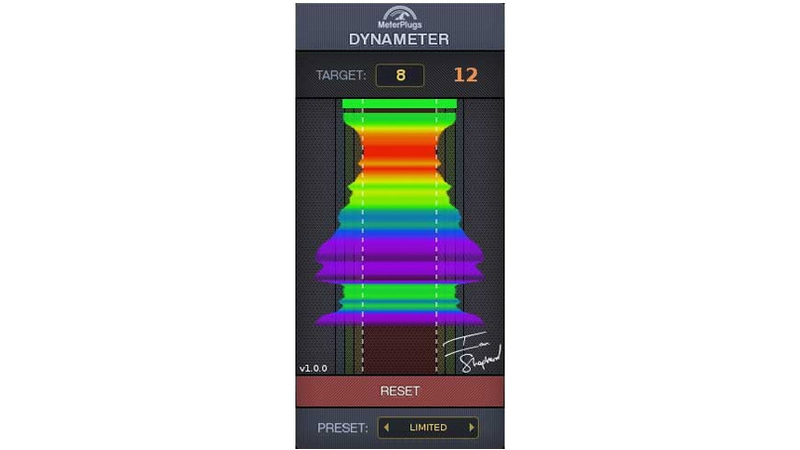 While not the sexiest of plug-ins (it’s just a meter), MeterPlus Dynameter has been the most influential plug-in in my arsenal ever since I first purchased it. The impact it’s had on my mixes and masters has been incredible! I just can’t do without it now. 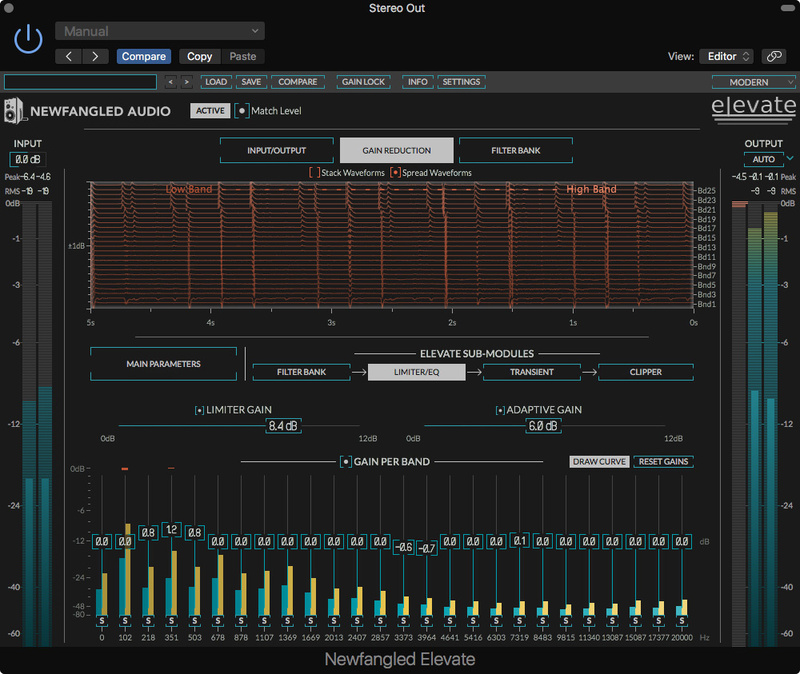 A collaboration with venerable digital meisters Eventide, Elevate claims to be “the most advanced mastering plug-in ever created”. Now mastering should very probably be left to people who know what they’re doing (ie. not me). But often projects don’t have the budget available, or it’s simply nice to get a demo sounding more polished, and in these situations it’s good to have a trick up your sleeve. I won’t pretend to understand the technical hoodoo that’s going on under the hood, but it’s something to do with (deep breath…) adaptive multi-band limiting based on 26 Mel scale linear phase auditory filters modelled on the human ear. If that sounds complicated, don’t worry - the informative GUI is intuitive, easy to navigate and very tweakable. Why do I like it? Because it sounds very natural - even when pushed into hard limiting – and it’s almost effortlessly easy to get good results. It has bumped off a load of other dynamics and EQ plug-ins from my mix bus and simplification is always good in my world. To my ears at least, it just sounds right. Swedish based XLN Audio is probably most famous for Addictive Drums 2. However, another one of their handy plug-ins is RC-20 Retro Color which uses their Flux Engine to add harmonic and analogue texture to almost anything. I find myself automating the Magnitude slider throughout a track to add extra dirt or character to particular sections. It works very well on things like soft synths, taking them more into an “analogue” direction. RC-20 usually ends up on sources for “retro” vocals and any instruments that just need that something extra - and the simple control layout and visual cues provide clear assistance. Similar in sound to magnetic tape and analogue harmonic distortion, I find RC-20 provides really flexible and quick solutions to sounds that are sounding a bit ‘flat’ in the box. Do you like smashing drums? Or pinning vocals and then adding a hair of bite? Or maybe you want a mix bus that tames yet sways? Then you need a Compex compressor! The Compex F760X is hardware only, but Boz Digital Labs has a solution for you in the +10dB channel. The “dB” stands for David Bendeth (renowned producer and user of these classic hardware boxes), and the plug-in comes very, very close to the sound of the original 1960/70 units. I use this on drums and guitars all the time. Also, I work with a studio that has the hardware originals and the tracks always get to the ‘right place’ with the plug-ins at my studio before comparing to the hardware units. We mix and match the hardware and plug-ins as it sounds so good. I feel parallel compression is where this plug-in truly excels, especially on drums - and with the legendary ‘expander’ you can soon get that "Jon Bonham" drum sound… should you want it! Reaktor is the only software synthesizer I’ve ever invested any serious time to. I’m also a hardware guy, so something really needs to stand out to get my attention! I’ve used almost every synthesizer plug-in out there, but nothing challenges my understanding of synthesis and meta-programming quite like Reaktor. The things you can do with Reaktor are truly limitless. Of course, it comes with a huge amount of pre-programmed presets and patches, but it’s the ability to start a patch completely from scratch that really appeals to my desire for sound exploration. 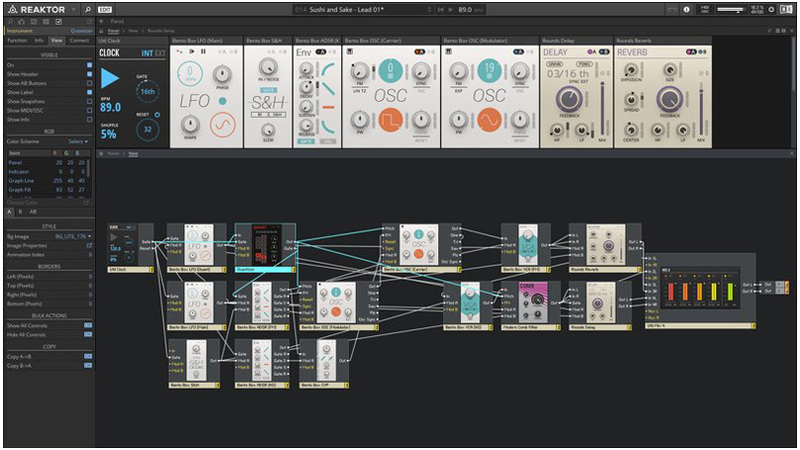 While getting to know Reaktor’s incredibly intricate back-end, I have learned so much about sound design, signal flow, modulation and event triggering. This understanding has transferred itself into other areas of my music and I now approach things with a very different mindset than I would have done before. When you make a patch from scratch that ends up being the defining part of your track, it’s a great feeling to know that you made ALL of the decisions that led to making that sound. No presets… all you! Sometimes a plug-in comes along that demands an emotional response. It can be negative when someone has done a poor job of ripping off one of my favourite synths, or it can be the polar opposite when I’m pleasantly surprised! The latter is true with the UAD Moog Multimode Filter XL, one of the best emulations of an analogue circuit that I have ever heard. Moogs filters are revered by the music making masses - you can literally buy t-shirts with the schematic of a transistor ladder filter on them! It’s a pretty simple circuit but it really did define the direction of synthesizers and electronic instruments that followed in Bob’s footsteps. 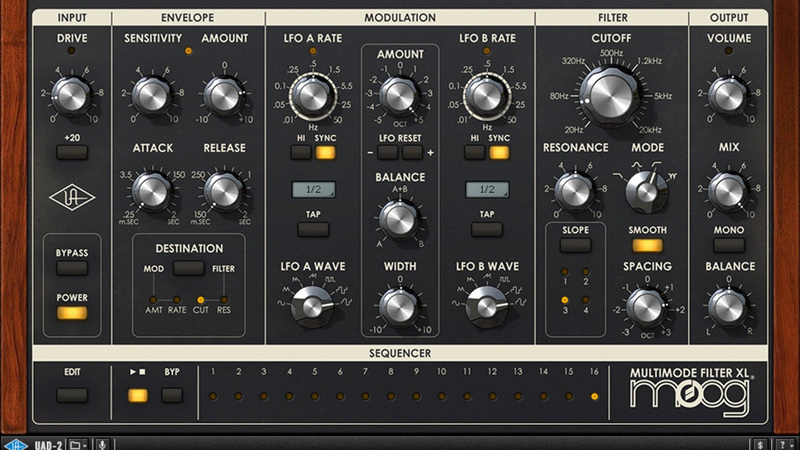 The UAD emulation of the Moog filter gives you a traditional low pass filter with four selectable slopes, two LFO’s with balance control and… the thing that really sells it to me…a sequencer section, where you can apply sequential changes to any of the parameters. This allows smooth swells, glitchy resonant peaks and much, much more. I use the Moog filter collection all over my mixes, and when I’m making samples for live sets, I'll usually reach for my UAD plug-ins to grab some tape saturation and some EQ, and then run it all through those lovely, thick Moog filters. Win!